The New Hermetics community is a large and diverse group of individuals who seek enlightenment, liberation, self-actualization, and are not afraid to apply every possible tool in their quest, both ancient and new. In order to most efficiently facilitate a more universal adepthood, Supervision and Certification in the New Hermetics system are now being offered. This is an opportunity to personally work with a New Hermetics Adept to obtain direction, inspiration and motivation in your work. We can only take on a limited number of students at a time, so please contact us quickly if you are interested in getting involved. The New Hermetics is a cutting edge spiritual technology that systematically teaches the science of illumination and power. It is also a collection of models for looking at the unconscious mind that allow us to create a dependable system for magically changing our lives. Basically, the New Hermetics is a synthesis of Western Esoteric Thought, Jungian Archetypes, Neuro-Linguistic Programming, Hypnosis, Vedantic and Taoist Philosophy, Reichian energy theories, the Eight Circuit Model of Consciousness, and Scientific Illuminism. When you work with the New Hermetics, you will experience consciousness changes that will dramatically increase your ability to change your world, and you will awaken your wisdom to handle this power safely. This is a technology that will permanently and positively change your mind and physiology. 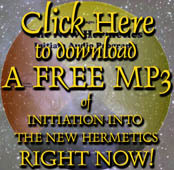 Using the new book, "The New Hermetics, " and the complete line of New Hermetics audio programs you will quickly unlock the latent potential for excellence and cosmic power within you. Each of these levels corresponds to a Qabalistic sephira and one or more paths on the Tree of Life, one of Timothy Leary's eight bio-circuits, the eastern chakras, and the four ancient elements, along with the fifth element of Spirit or Æthyr.